Climate-friendly and strong printing performance! 1913 – The company was founded. In the mid 1930s a typesetting machine with lead typesetting was added to the hand setting technology. 1936 – BuLu was the first company in Austria with Original Heidelberg Cylinder technology. 1950 – The former location in the centre of Lustenau was enlarged. At the end of the 1950s BuLu acquired its first offset printing machine. 1999 – The company Pfanner Druck (offset printing) in Bregenz was taken over by BuLu and established as a branch office. 2000 – A greater move was planned. Along with the branch office in Bregenz, the headquarters was moved into the purpose built, ultra-modern building in Millennium Industrial Park in Lustenau. 2007 – The first Heidelberg XL 105 printing press was acquired, wherein even larger print formats (75×105 cm) become possible. 2009 – Another Speedmaster XL 105 was acquired, extending our machinery. With a print speed of 18,000 sheets per hour, it is the fastest offset printing machine available from Heidelberg. 2011 – BuLu is the first company in Vorarlberg to receive the international GREEN BRANDS award. Customers also appreciate the environmental protection measures. 2012 – BuLu started the year with the addition of a new department, BuLu Digital, and has thereby expanded their product range considerably – from photography to digital printing on various different materials. 2013 – BuLu obtained one of the latest and largest sheetfed offset printing machines in the world – a 10-colour Heidelberg Speedmaster XL 106 including two coating units – one before the print sheet is turned, and one after. 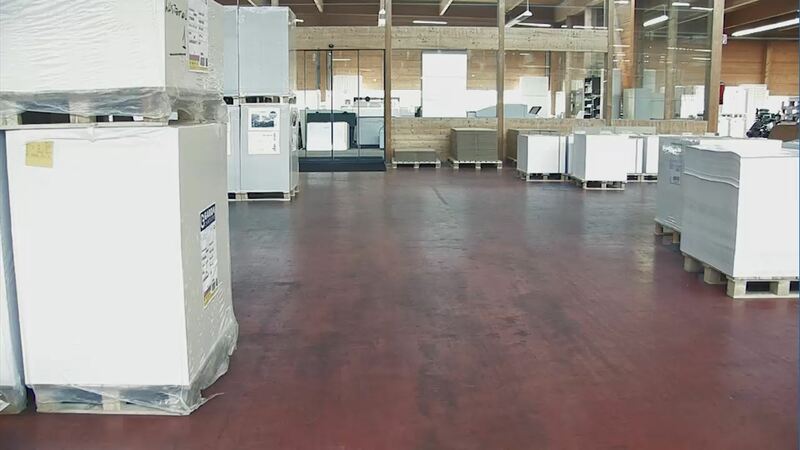 On July 8, 2013, for the first time, four printing houses in Austria, including Buchdruckerei Lustenau were awarded the European eco-label, in Vienna. 2016 – Resource reduction achieved by implementing ISO 5001 energy managment system. 2017 – BuLu starts its online shop. From now on our customers can order their printed materials 24-7. 2017 – BuLu is the first company in Austria to offer environmentally friendly spine glue application with PUR and side glue application with PUR. Our customers love the very good quality of our perfect bound products. Lastingness is for us no fig leaf, but a lived value at all levels and encompases a logical adjustment for ecological, economic and social interests. We promote environmentally friendly print products as part of our customer offering. For our pragmatic and flexible support to employees such as maternity leave and recommencement of employment, as well as our tailor-made employee education and health insurance, BuLu was given the Vorarlberg Award “Ausgezeichneter familienfreundlicher Betrieb (excellent family-friendly company“ in 2009. Buchruckerei Lustenau’s Code of Conduct conforms to the applied values in business. We want to be a dependable partner in our region and see it as our duty to assume responsibility for our social and natural surroundings. At the heart of this are our employees. Respect and security in the workplace, the work-life balance, equality and further education opportunities form the basis of collective, effective work. We deal with our customers and suppliers respectfully and reliably. Service and quality must meet certain requirements and we contractually fulfil the conditions stipulated. It is a matter of great concern to us to mitigate potential conflicts of interest as early as possible and to solve them properly. We pledge hereto that we do not engage in child labour, forced labour or any form of discrimination. We do not tolerate corruption or financial crimes. We adhere to the law of the land in this regard. The handling of civil disobedience, i.e. strikes and other incidences, is regulated by an emergency contingency plan and in negotiation with senior management. We strive not only to fulfil all legal standards, but also to surpass them, in order to maintain a sustainable and secure future.